If you have a car fan to buy for then there’s almost certainly one safe bet when it comes to buying gifts – Top Gear. The hit BBC show has a massive range of merchandise from DVD box sets to clothing, books and toys. Now you can even pretend to be part of the show – with a track day experience at the Top Gear Test Track. Visitors will start their day in the studio, complete with famous car interior seats, cool wall and various cars from Top Gear challenges. There’s then a selection of experiences to pick from – so we went along to see how authentic they are. There are plenty to choose from, with prices from £45 to £175 and yes, you can drive the reasonably priced car around the proper, full-length test track. So obviously we had a go at that – although we won’t go into times. Faster than John Prescott, at least. The Reasonably Priced Car lap is more or less the premium experience and it costs the full £175. You get to go around with an instructor, who’ll show you the layout of the track and teach you where to brake and when to accelerate. It might only be in a Kia Cee’d but it’s very exciting indeed. Your time is recorded, along with a video of your lap from two points of view, with a USB stick to take home for posterity. There’s even an online leaderboard so you can compare your time to celebrities and other Track Experience visitors. Youngsters can enjoy themselves too, with off-road experiences suitable for under-17s. These are in Range Rover Evoques, rather than the usual learner wheels - and they involve a lesson with a fully qualified instructor both on and off the tarmac. Other experiences include hot laps with The Stig (he doesn’t speak), along with lessons in how to handle a modern hot hatch on a twisting track. Another highlight is the opportunity to drive the Ariel Atom – the car which famously rearranged Jeremy Clarkson’s face. It’ll rearrange your face too – open faced helmets are supplied and a cleverly mounted camera records the whole thing so you can play it back to your heart’s content. The Atom itself is about as exciting as cars get, so it’s well worth a go. The highlight of the whole selection of experiences is the Reasonably Priced Car though. It might be expensive at £175, but there’s no other track experience in the UK quite like it. Driving the actual Top Gear Test Track in the proper Reasonably Priced car is something a lot of car fans will have wished to be able to do – and now you can. 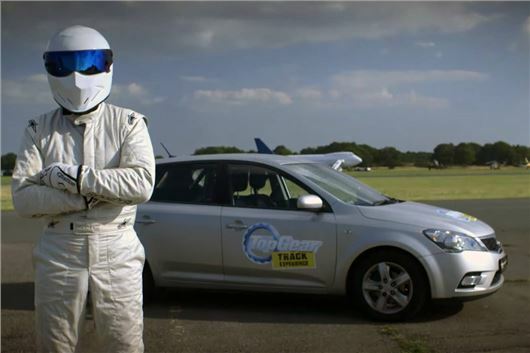 For more information on the Top Gear Track Experience click here.